Capital One Work From Home Jobs – Make $13+ Hourly! Published January 18, 2014 By Anna T. This post may contain affiliate links. Regardless, I only recommend sites I've researched and/or used and trust. 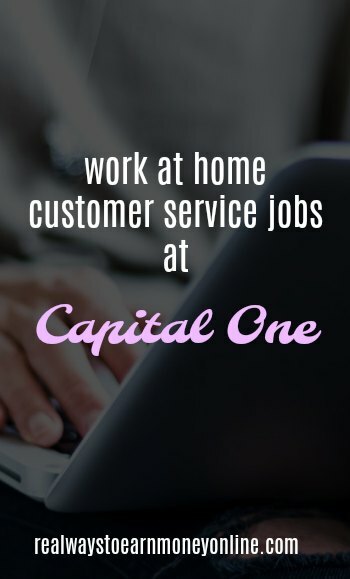 Capital One is a company that I am always seeing with openings for home-based customer service workers in the US. I post this job on my work at home job leads board more than a few times per month usually because it seems to always be open. The big downside to this position is that it's location-based. While you do the work from your home, you are required to train onsite for a period of time before you can start working from home. And because of this, the state you live in does matter. The company is frequently looking for people who live in Virginia and Florida for the work at home positions. They may possibly recruit in other states as well, but these are the ones I see open most often. Salary information for Capital One on Glassdoor indicates that customer service reps make in the neighborhood of $27K per year, and one person on Glassdoor who had just been hired for the work from home position in August of this year stated she would be making $13.03 per hour. In addition, I found some reviews from current/former employees who say pay is good and that it's possible to receive up to $1,000 per month in bonuses. This is an employee position, so this means it's a work from home job with benefits. And Capital One apparently is pretty generous with their benefits. They offer medical, dental, vision, and also 401K. I am not clear on whether or not everyone gets the exact same benefits or if it varies depending on your specific role or whether or not you work from home or at one of the locations. Reading through the Capital One reviews on Glassdoor, I'm seeing some people report that their benefits kicked in on day one, while someone else said their benefits would start after six months. But either way, it looks like they offer a lot. They also have a list of “preferred” qualifications such as a bachelor's degree, knowledge of the financial/credit industry, and small business experience. But you have a shot even without all that provided you meet the minimum qualifications listed above. As I mentioned above, the customer service work from home positions at Capital One are location-based. This is so you can come in for training prior to working at home. However, the onsite training only lasts for a few days at their location and then you are allowed to train the rest of the time at your home. Training goes on for approximately seven weeks. So if you live in one of the states where Capital One hires home-based workers and you would be required to drive quite a distance to come in for training, it sounds like you'd only have to do it a few times. Virginia and Florida are the two states that I see posted most often for the work from home positions. Sometimes there are openings in Delaware and possibly other states, too. You need high speed internet with a hard-wired connection and a land line phone. Your internet connection and phone line may only be used for Capital One's purposes during your scheduled work hours. I read on Glassdoor where one work from home employee for Capital One stated that all the computer equipment she needed to do the job was supplied to her by Capital One. Capital One will have different schedules you can choose from. You'll get to pick one after you receive a formal offer letter from them. You work 30 hours per week, and once your schedule is decided, it's considered a one year commitment, so you will probably not be able to change it for a year once it's set. After you fill out the application, you do a phone call test. Then, after that there are numerous interviews and a mock call. It can take several weeks before you are officially done with the application process from the time you start it. I found some great information here at Glassdoor regarding the interview process for Capital One's work from home employees. This time, the work from home forums did not turn up much information for me when researching Capital One's work from home jobs. Most of what I found at WAHM and Work Place Like Home were job lead postings for Capital One and general questions people asked about the job (most of which didn't have responses). But Glassdoor has been a treasure trove of information! Tip – If you are researching a company, always check Glassdoor in addition to searching the forums. Lots of times you'll find exactly what you need there. Most of what I've read about the work from home customer service positions at Capital One has been good. People feel they are fairly compensated and enjoy the benefits plus being able to work at home. There were some mentions of occasional tech difficulties and also the training materials being a lot to take in, but the general feeling is pretty positive. Go here to read reviews of the customer service positions at Capital One on Glassdoor. Keep in mind that some of these reviews (actually most of them) are from people working at one of the locations, so keep your eyes peeled for the reviews where people mention working at home. This page should take you to the currently open positions. To find the work from home jobs, scroll through the jobs listed and look for the ones that say “work from home” in the titles. Looking for more reputable companies that hire home-based workers? A one-month subscription is $14.95 and you can cancel very easily at any time if you're not impressed. I used to work at this position for Capital One last year. The only reason why I stopped working there was for personal reasons (nothing related to the actual company), but it is a great work at home job. You will have to come on site once a week for the first 4 weeks of training, but besides that it’s all done from home. The benefits are great and they start 401k matching from the very first day! (I forgot the percentage).